Cos, cot, and cosec are cofunctions of sin, tan and sec, hence they are prefixed with "co". Highlighted here is the relationship between the basic trig functions whose arguments together make complementary angles. 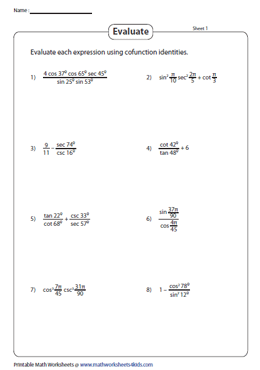 Learn the cofunction identities in degrees as well as radians from the trigonometric identities chart and practice exercises like solving and evaluating trigonometric functions. 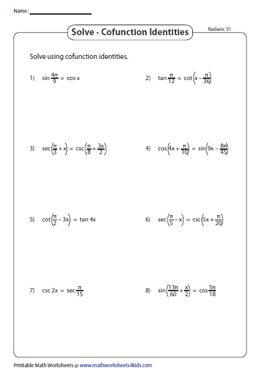 Incorporated here are tasks to determine the angle of a trigonometric function using the cofunction identities that make a sum of 90o or ∏/2 with the angle of its cofunction. 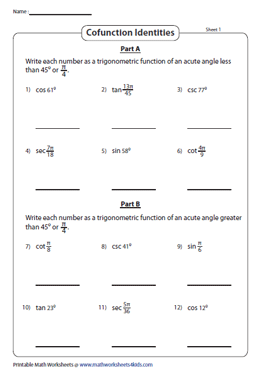 Tackle these two-part worksheets featuring exercises to express a trigonometric function as an acute angle less than 45o or ∏/4 in Part A and greater than 45o or ∏/4 in Part B. 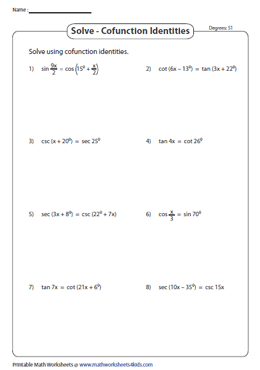 Specifically dealing with degrees, these worksheets encompass exercises to determine the value of 'x' by solving the trigonometric expression applying the cofunction identity. 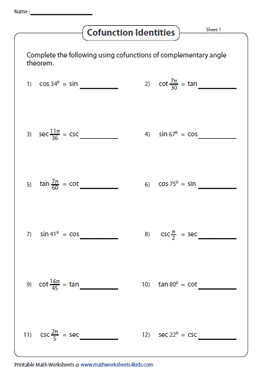 Use the complementary angle theorem to solve the trigonometric equations with the angle measures in radians in this set of worksheets. Reiterate cofunction identities and apply them to evaluate trigonometric expressions involving a mix of degrees and radians.